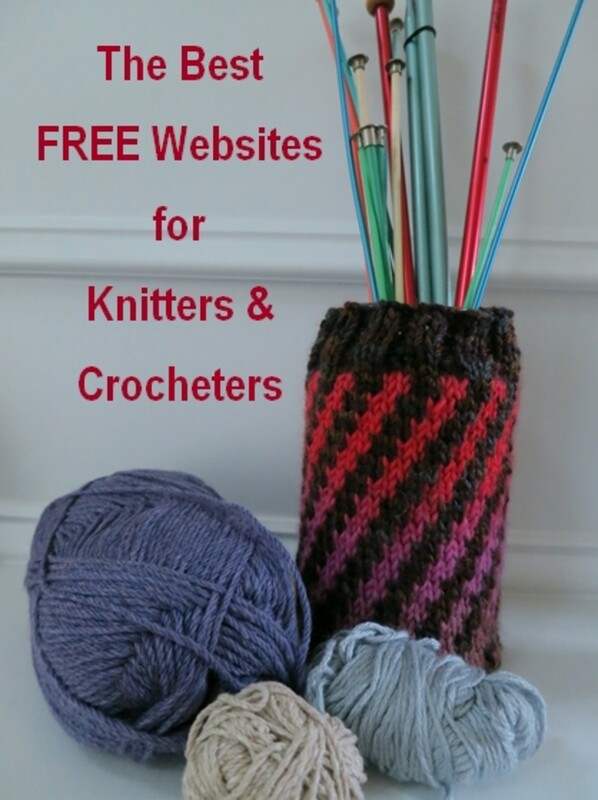 Here's a great collection of free knitting patterns for the beginning to experienced knitter. These patterns are a colorful mix of baby things, cozy accessories, household goods, knitted jewelry, and gift ideas. 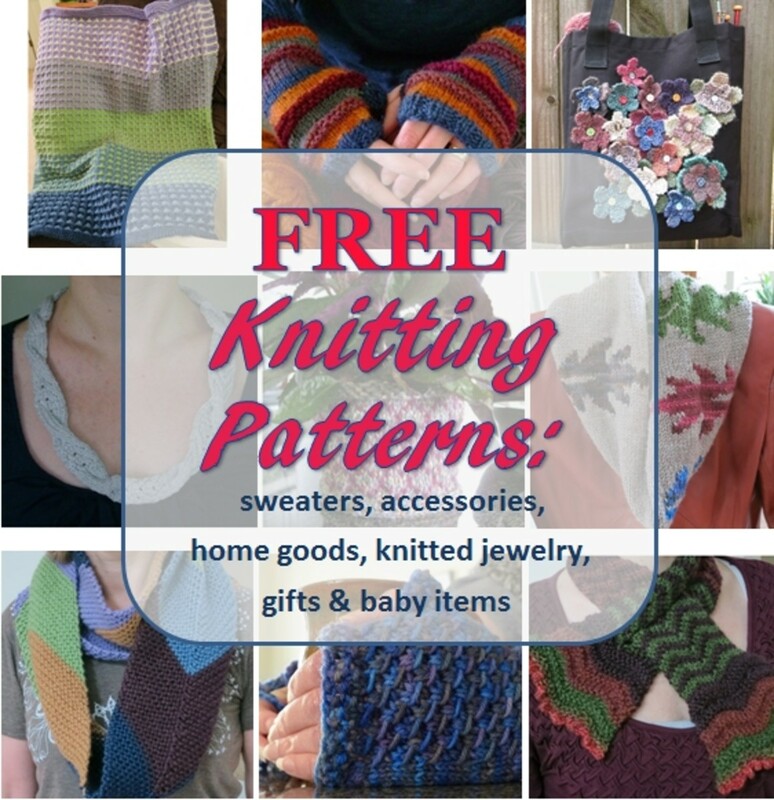 You're sure to find a pattern or two (or more) to fit your knitting style and skill level. These patterns are listed under item type or category. Scroll down to see all the categories. Be sure to revisit this page as new patterns are listed! The Color Field Baby Blanket: This ever-popular design is a surprisingly easy pattern and makes for the perfect baby shower gift. 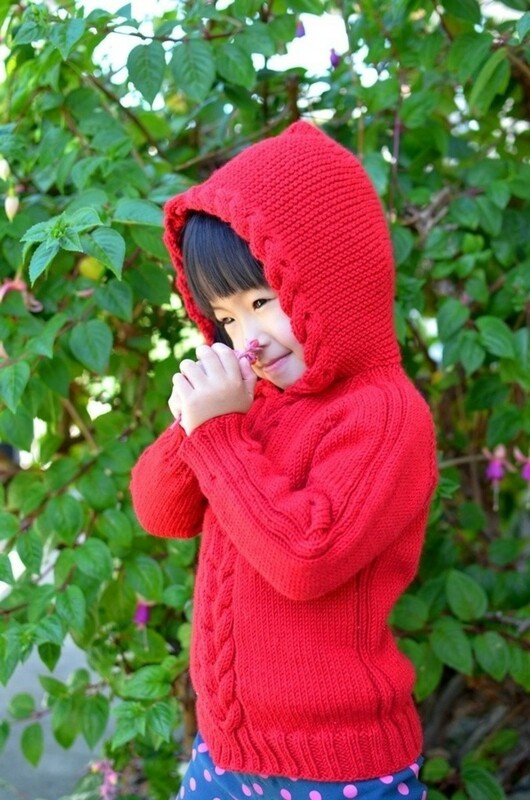 This slip-stitch knitting pattern is a quick knit and allows you to easily modify your color scheme to match any nursery. The size of this blanket is also easily adaptable. 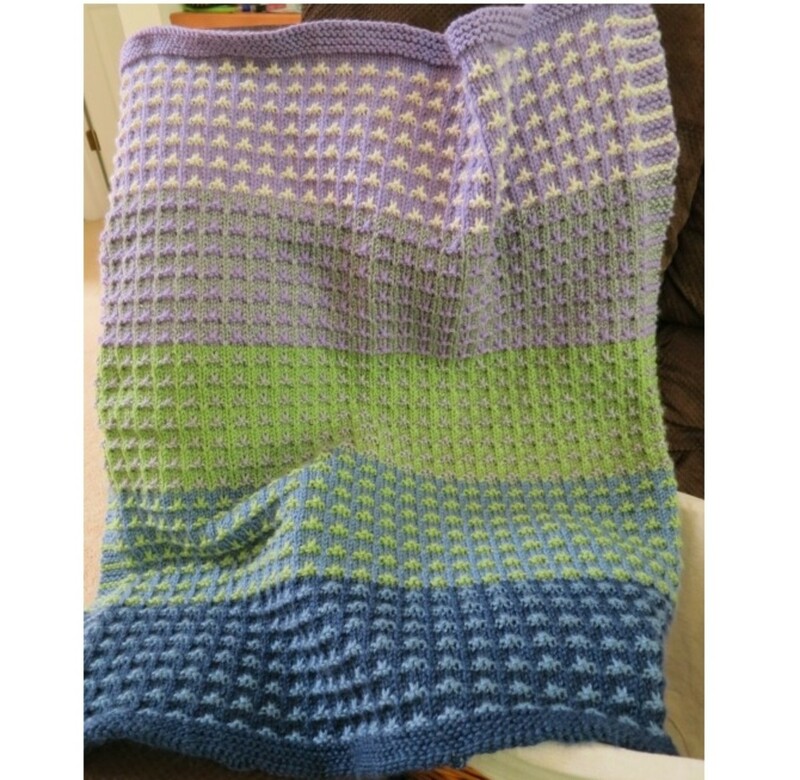 The Mosaic Baby Blanket: One of my favorite patterns, this design looks intricate and complicated, but is actually quite simple. Using three colors, this pattern creates keepsake item that is perfect for any new addition! 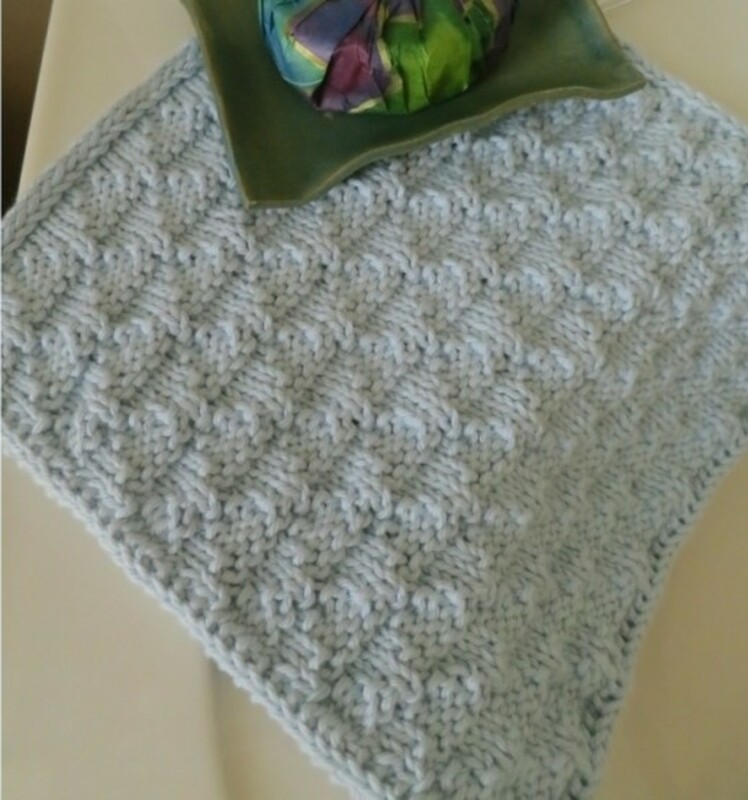 Sweet Cables Baby Blanket: This cozy baby blanket knits up quickly using a bulky or chunky weight yarn. 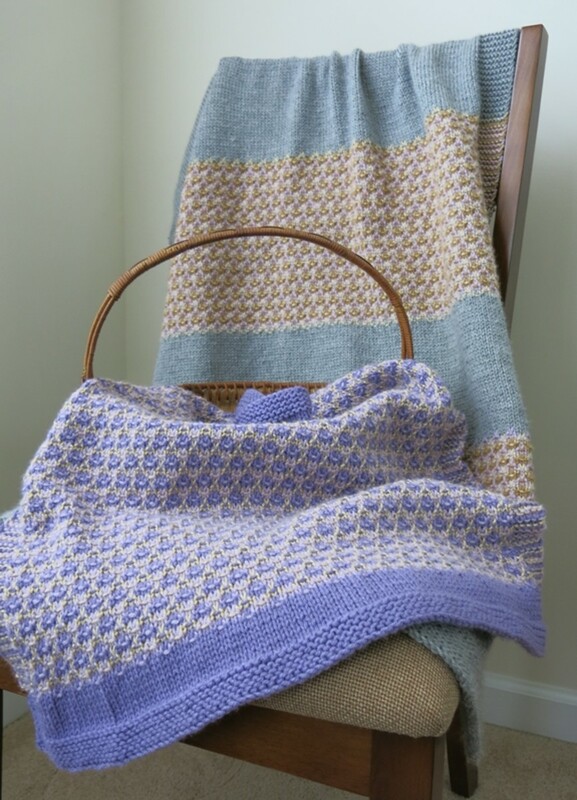 With a charming mix of cables and a little bit of lace, this blanket would look lovely and warm in any nursery. 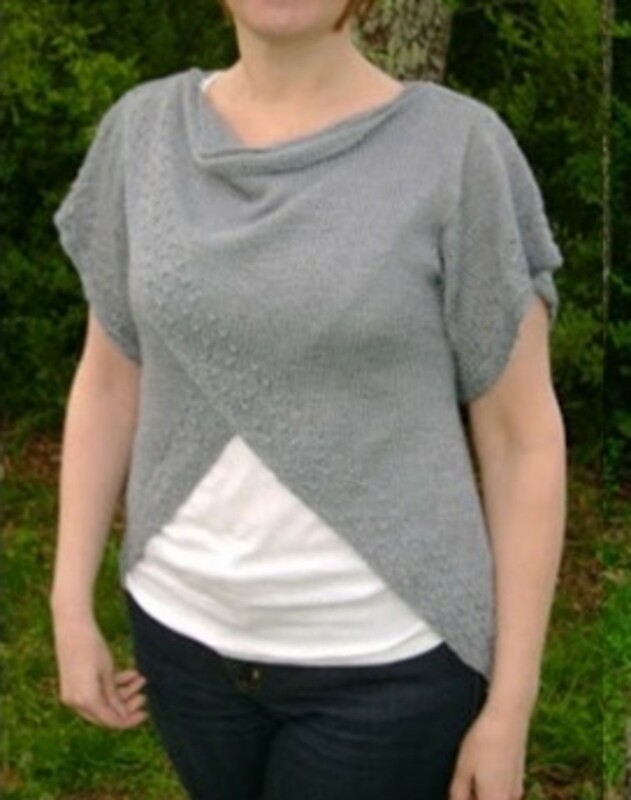 The Tulip Wrap Top: this knitting pattern is more of a recipe that allows you to use any yarn, gauge, and your size to create this floaty top or wrap. Worn open with a little lace detail at the edge, this top is perfect for a summer evening on the town. The Crossroads Textured Shawl: I must admit, I'm not much of a shawl wearer. So I designed this wrap so it could be worn either casually with a t-shirt and a pair of jeans or more formally to top off a skirt or evening attire. The alternating stripes keep this design casual but the addition of some textured edging makes this shawl something special. The Blooming Colors Scarf: This scarf is really a scarflet - a short neck warmer that crosses in front to create a warm and fashionable accessory. 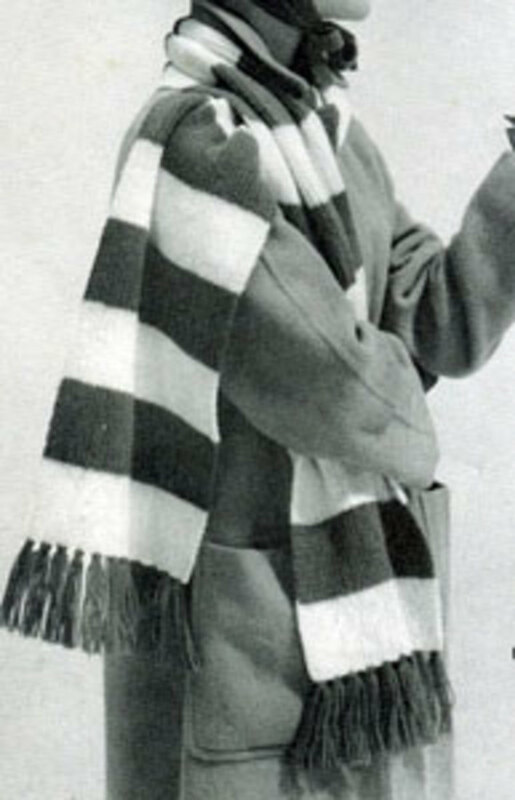 Featuring a mix of knitting patterns, this scarflet has a slight vintage look to it and is a great "in between" item to wear with your winter coat or your favorite fall sweater. 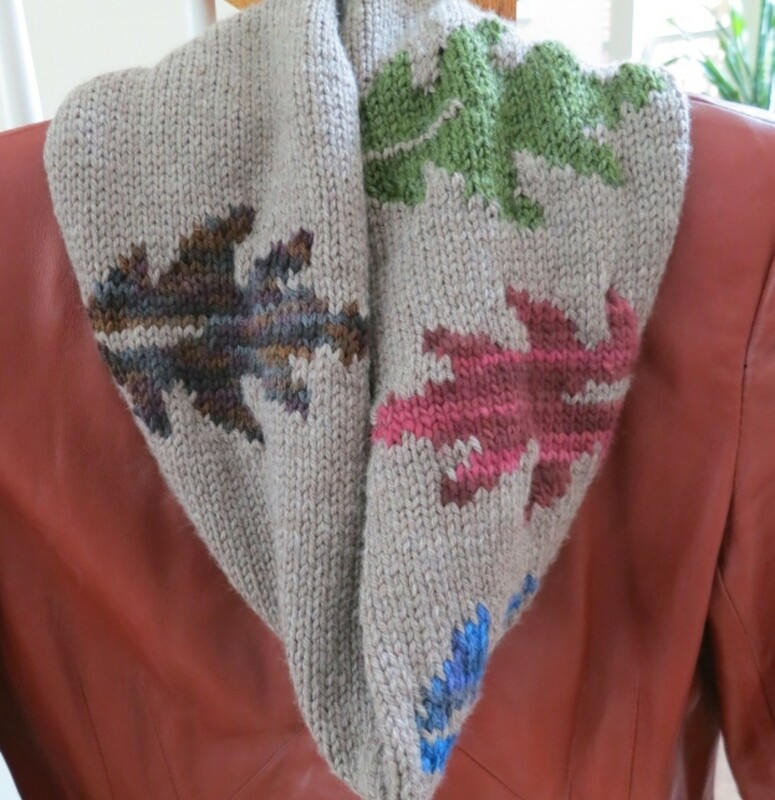 The Changing Leaves Cowl or Scarf: Another one of my favorite patterns! 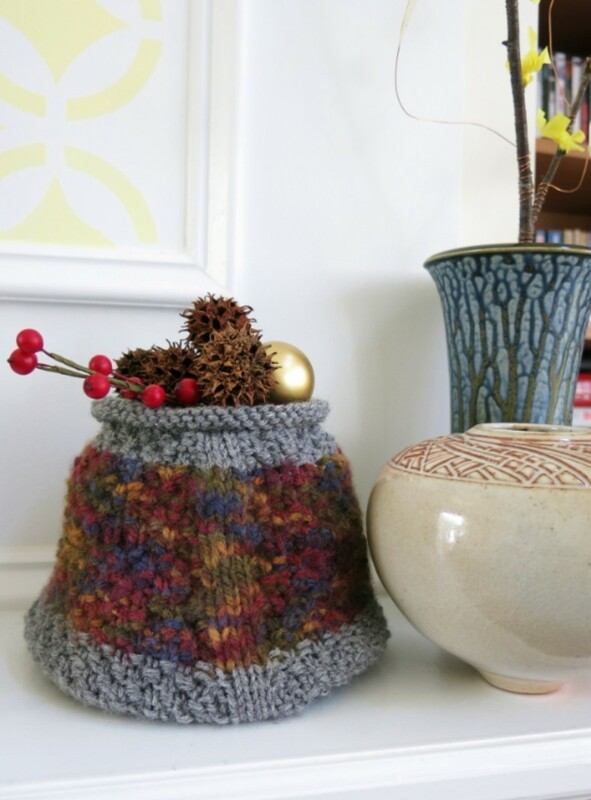 This design is a great way to use up any bits of your favorite variegated yarn to create these lovely falling leaves. 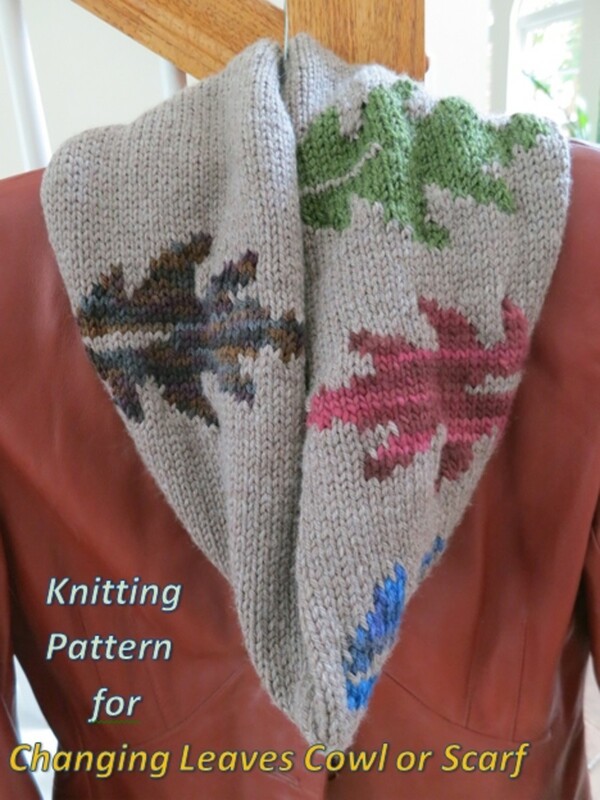 This knitting pattern includes directions to make either a cowl or scarf, both decorated with colorful autumn leaves. 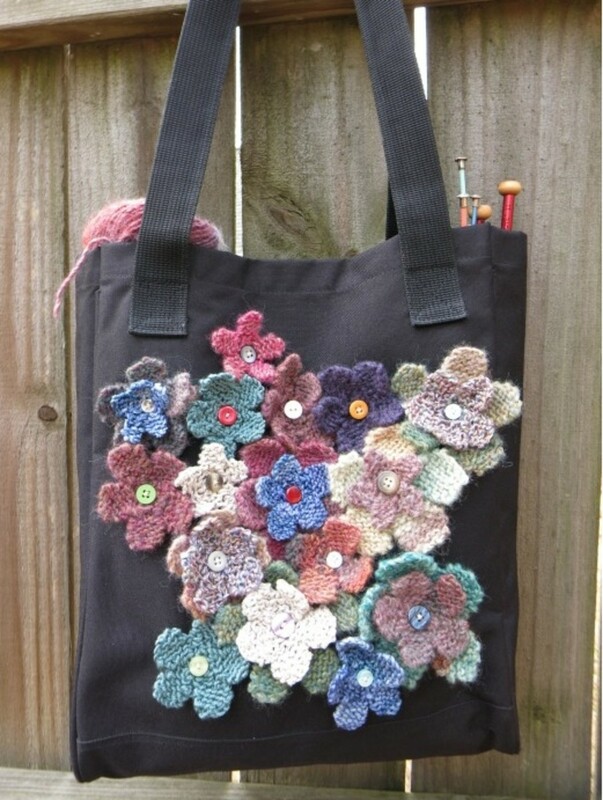 Field of Flowers Recycled Tote Bag: Breathe new life into an old tote bag by knitting a bouquet of flowers to decorate and cover its exterior! These knitted flowers are a fun way to cover up ugly logos and refashion an old bag into something you're proud to use. This pattern includes directions on knitting different sized flowers and how to attach them to your bag. The Cabled Modern English Cowl: This chunky cowl features an easy but eye-catching cable pattern that runs around this cowl, creating a polished and elegant look. This is a charted pattern, but easy to follow for a beginner or experienced knitter. Reindeer Tracks Cowl: This knitted cowl features a slipped stitch pattern knit in a worsted weight yarn. 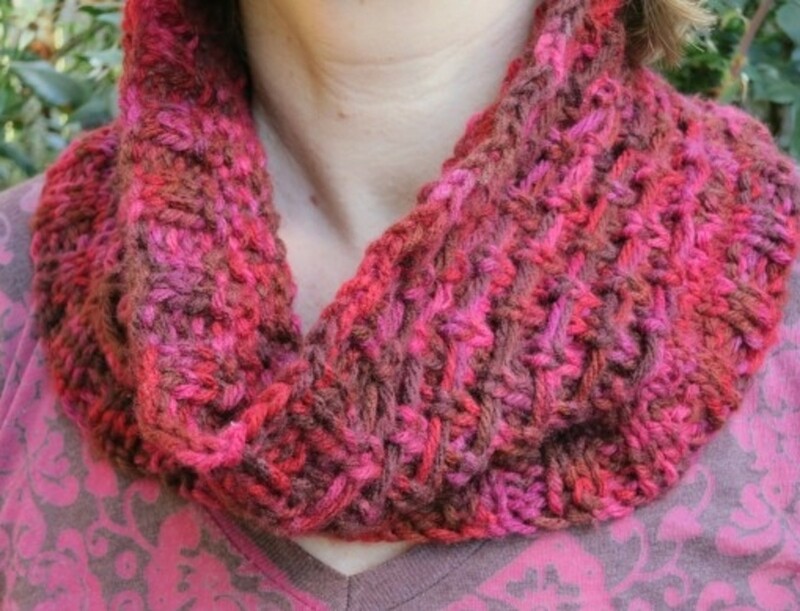 This cowl was designed to use variegated yarn, but also looks great in a solid color. 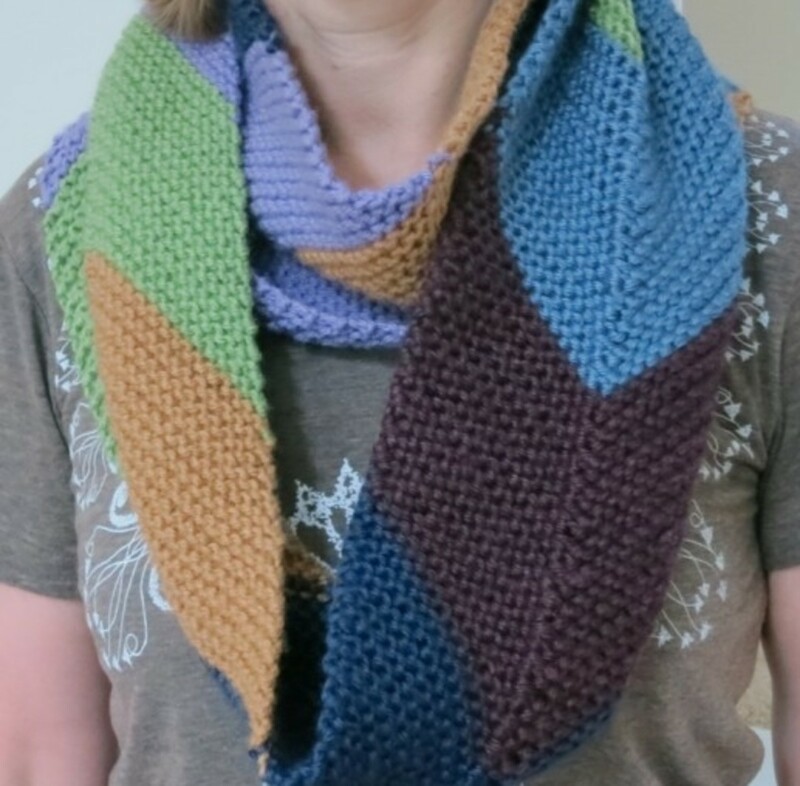 This pattern is a quick knit and makes a wonderful Christmas gift! Textured Fingerless Mitts or Gloves: These fingerless mitts are specially designed with an interesting, yet easy design on the back of the hand and a snug ribbing at the wrist to keep your hands warm. 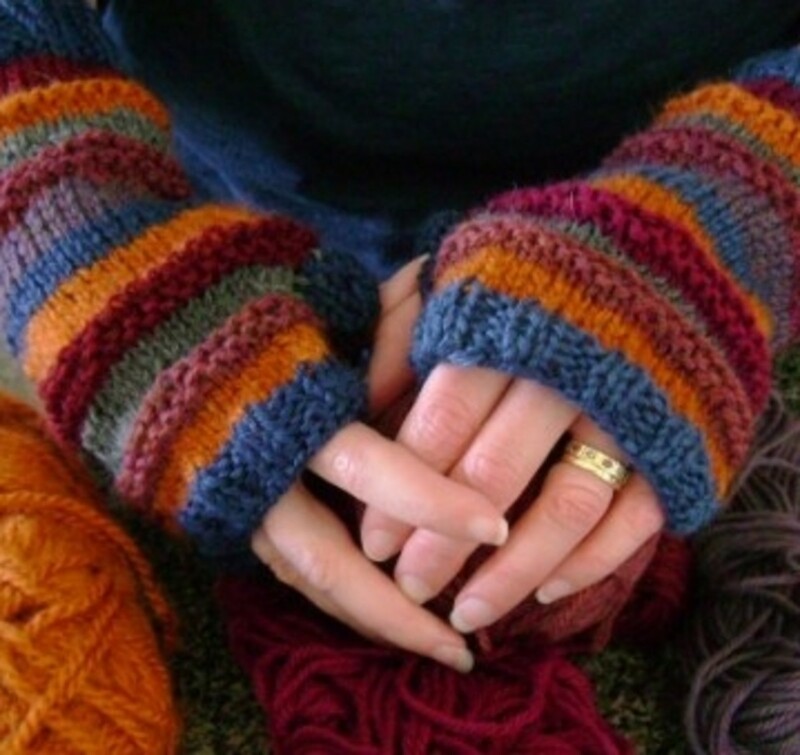 This is a great pattern if you are knitting your first (or 50th) pair of fingerless mitts! 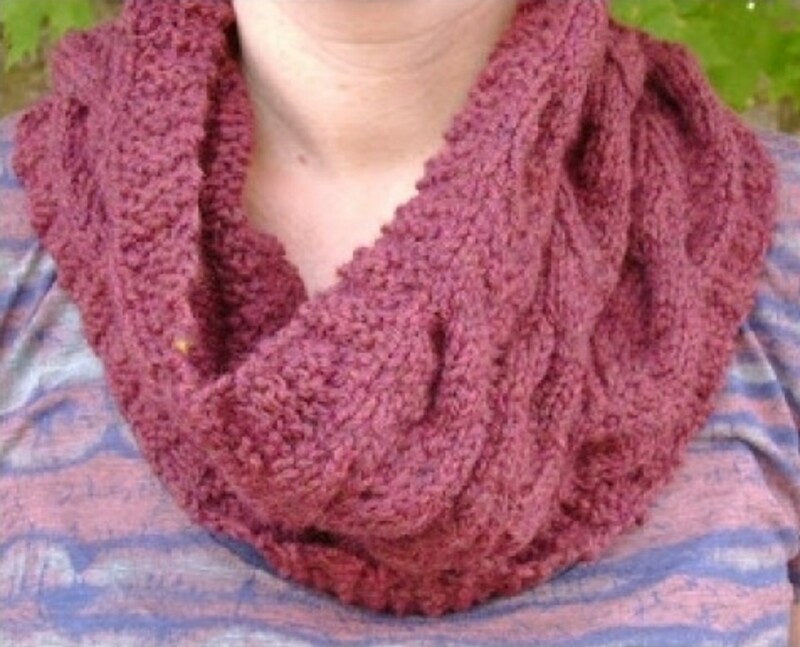 Looking for a matching cowl? 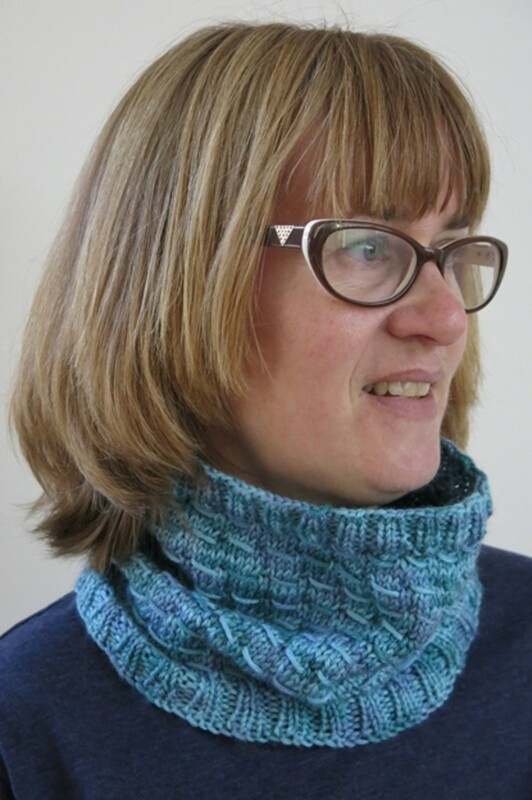 Try the Slight Shifting Knitted Cowl pattern below! Slightly Shifting Knitted Cowl: Often a simple design is the best way to show off the beautiful colors of variegated yarn. This casual cowl is designed to bring some stitches to the front, which mixes up and shows off the changing colors of variegated yarn (though you could also knit this cowl in a solid color too). This cowl is the perfect companion to the Textured Fingerless Mitts pattern above, making a lovely set to give as a gift. Stash-o-motastic Fingerless Mitts or Gloves: I love any pattern that allows me to use my stash or leftover yarn from other projects. 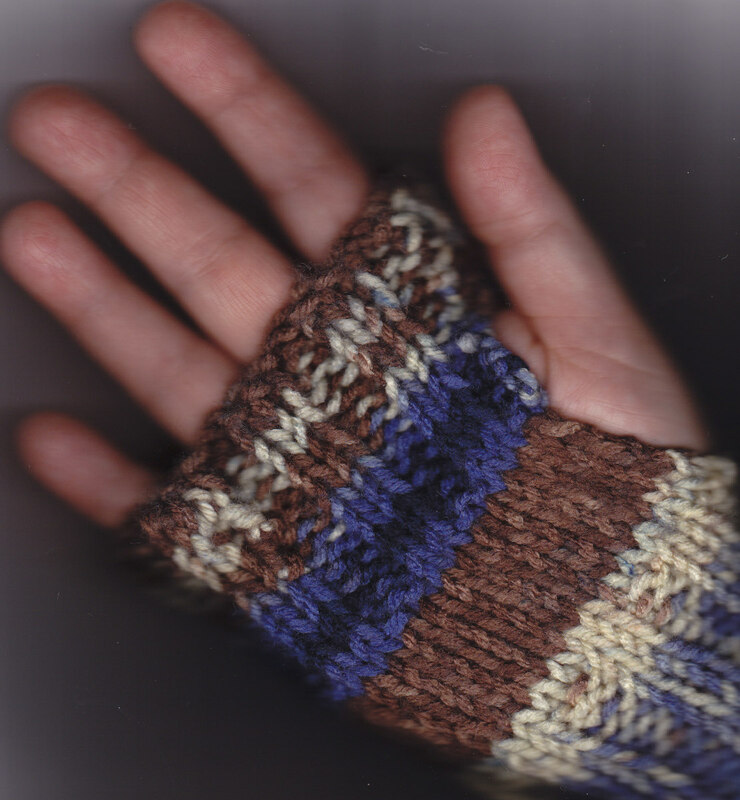 The Stash-o-motastic mitts are designed with an array of stripes knit in worsted to bulky weight yarn. 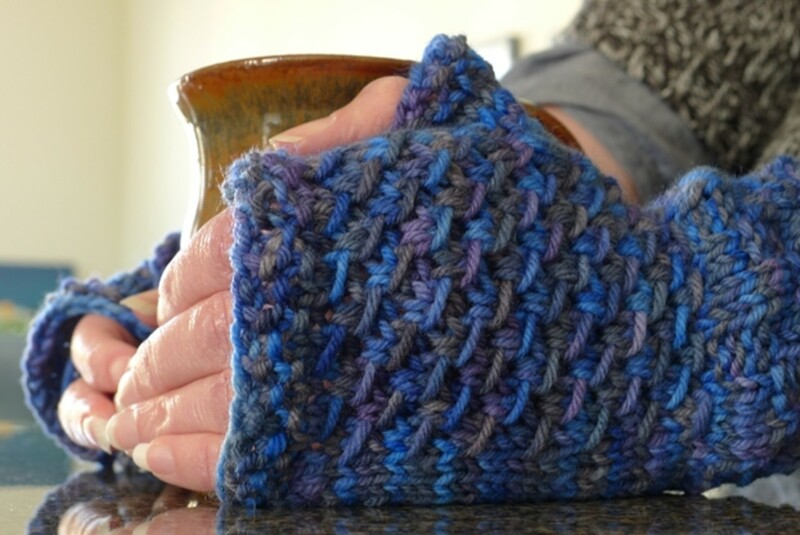 You'll be surprised at how beautiful your stash yarn will look knit up in these mitts! 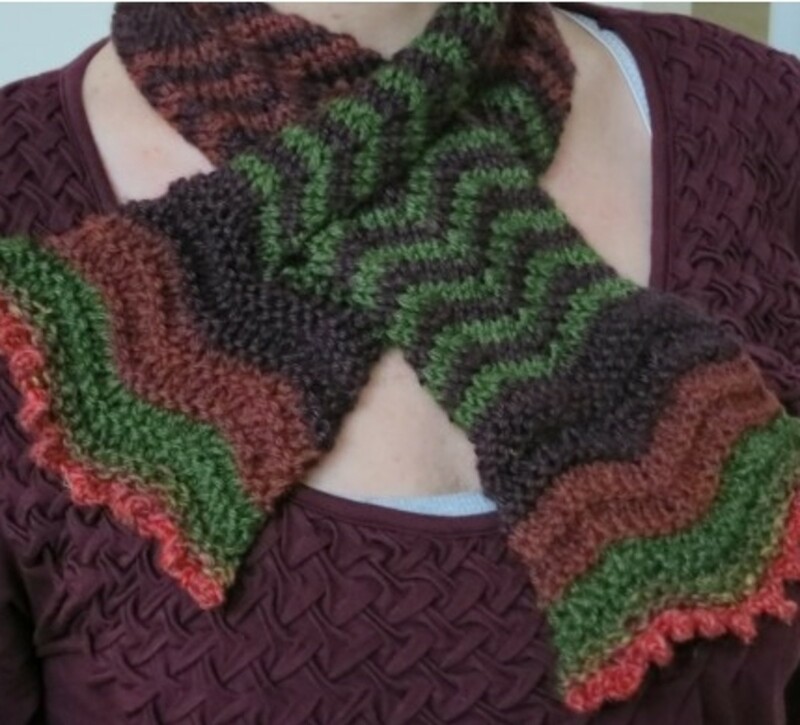 This Way Up Cowl: Another great "stashbuster" knitting pattern, this chevron design can either be knit using your leftover yarn, or specifically created to show off your school's or favorite team's colors. The High Tea Collar Necklace: This cabled neck piece can either be worn as a necklace with the closure in the back, or as a collar with the button detail in the front. This charming accessory has a little bit of lace and a vintage feel to it. 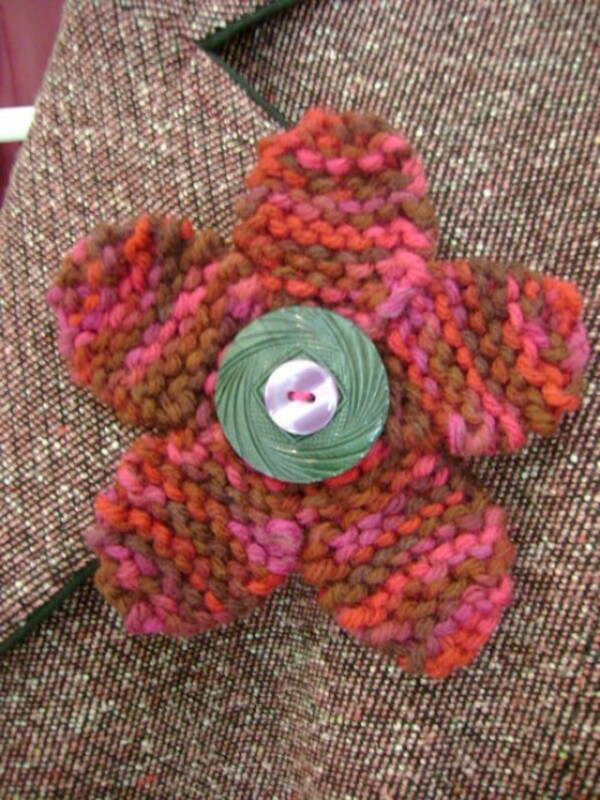 Flirty Flower Pin with Button Center: This quick and easy pattern creates a cute flower accessory to wear almost anywhere. Although the pattern includes directions for making this knitted flower into a pin or brooch, you could also use these colorful blooms as decorations for a pillow, sweater, hat, purse, or headband. 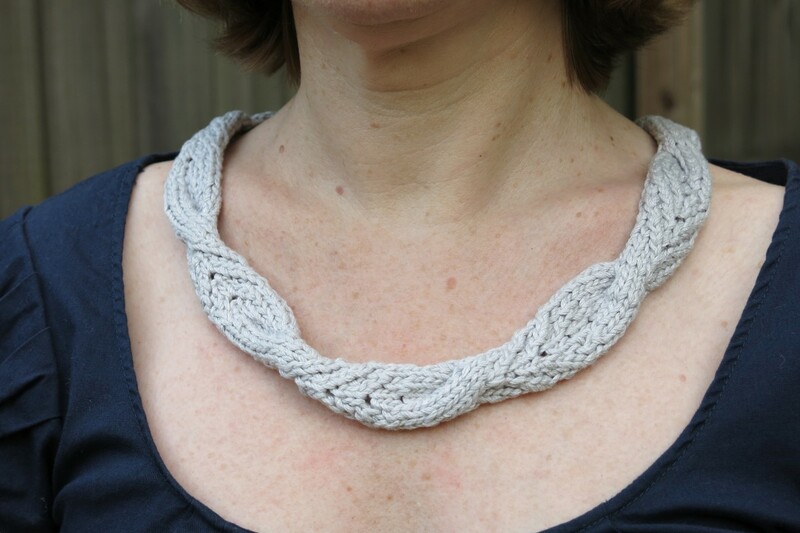 Chunky I-Cord Statement Necklaces: I-cords are one of the most versatile techniques you can learn in knitting. Here are directions to turn these simple cords into three stunning statement necklaces. 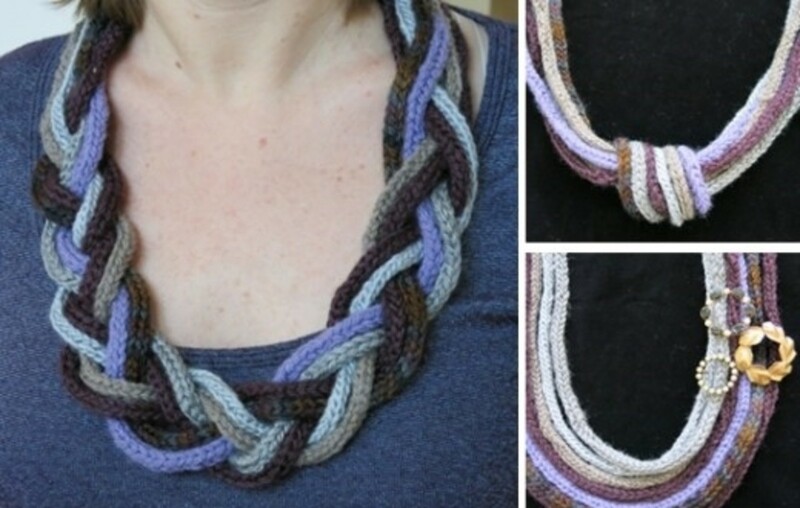 Loopy Loop Necklace: I-cords can also be a fun way to create new accessories. 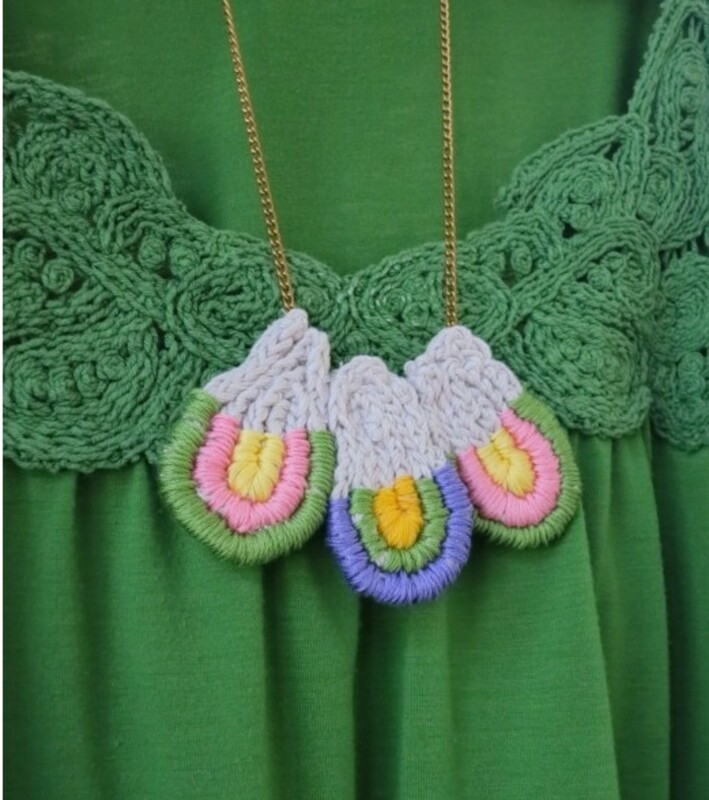 Add a little embroidery and you have a colorful and on-trend geometric necklace. 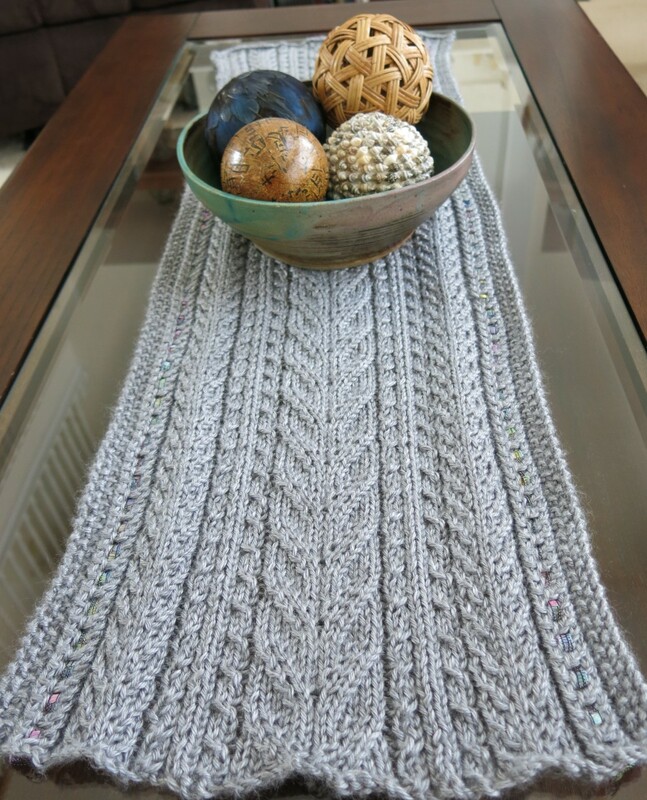 Lace & Cables Table Runner: Often I design knitting patterns for my own use. When I wanted a table runner for my coffee table, I created this mix of cables and lace that is casual enough for every day use, yet can also be used for a formal occasion. I added a bit of ribbon trim to the edges for more interest, but this is optional. 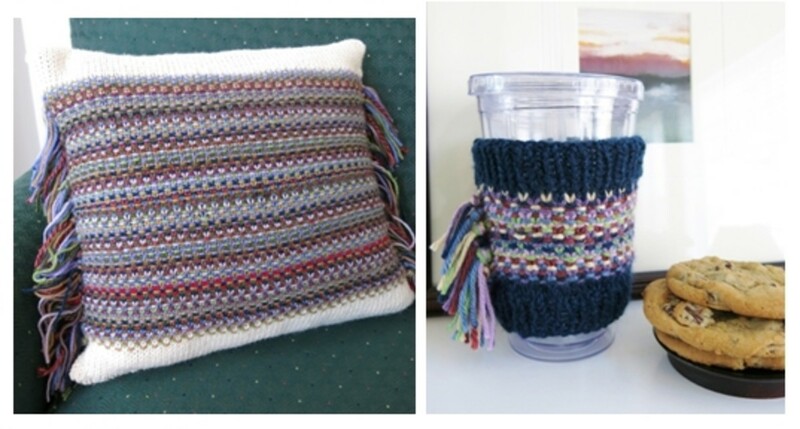 Confetti Fringe Pillow Cover or Cup Cozy - These colorful accessories will add cheer and a bit of fun to any room or occasion. These decorative items feature a playful fringe that holds the side seams of these items together, resulting in little finishing at the end. Great for stash-busting, the directions for both of these patterns are included with this link. Knitted Pinwheel Basket: This colorful home accessory starts with a round coaster pattern to use as the bottom or base of your basket. 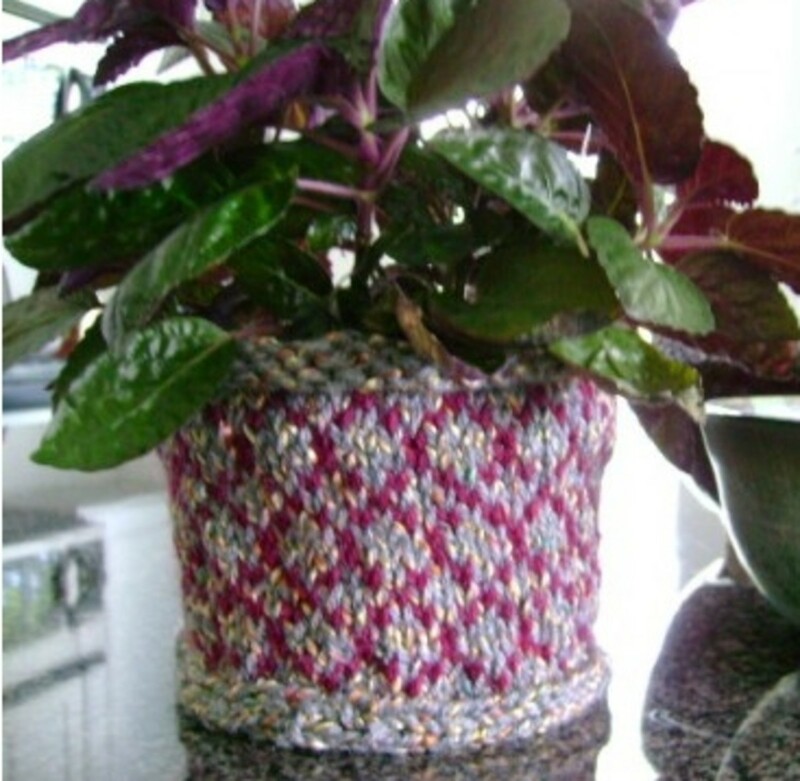 The sides are then picked up and knitted in a diamond design, creating a handy basket for a plant or your knitting tools! Geometric Basket - This decorative basket is the perfect size for holding small objects or displaying a pretty plant. The basket is started with a circular base, then stitches are picked up around the edge to knit the sides. 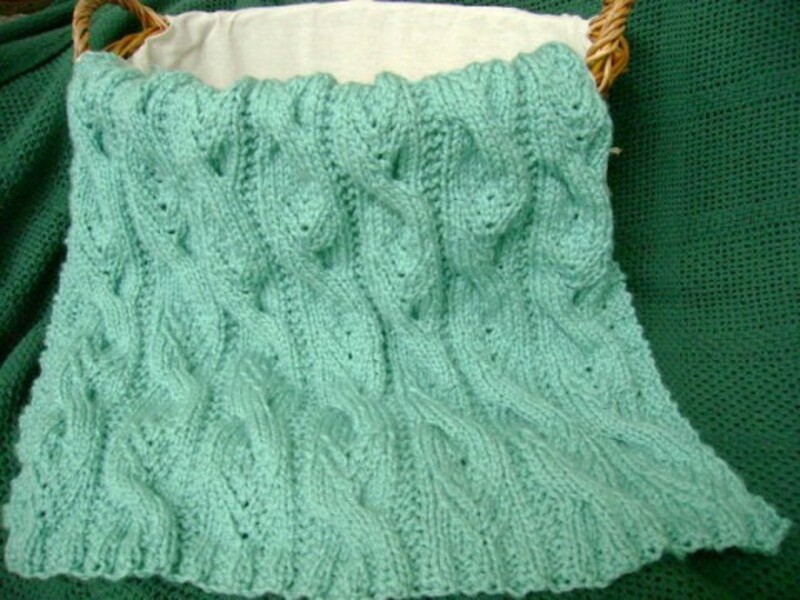 The basket design includes textures stitches and three bands of knit stitches running up the sides for added interest. Although I knit this with a variegated yarn, this basket would also look beautiful in a solid color, or with more stripes. 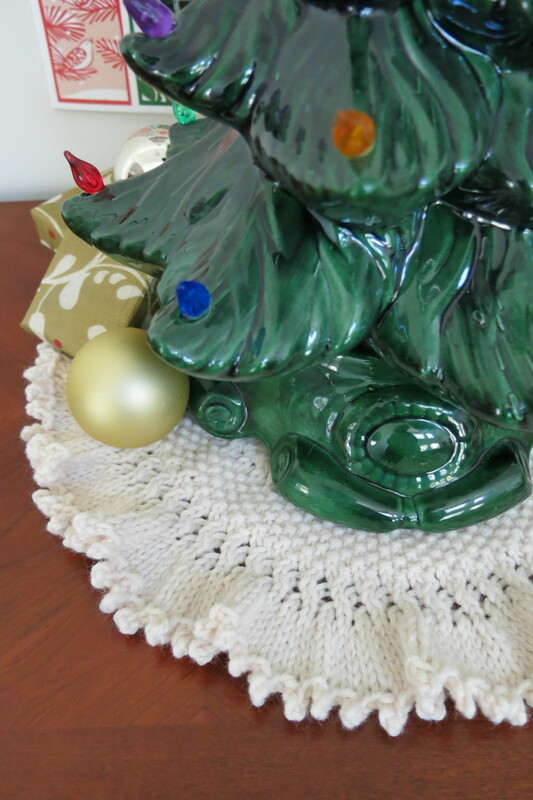 Knitted Tree Skirt (or Doily) for a Table-Top Christmas Tree: This circular pattern is the perfect accessory for any miniature or table-top Christmas tree. Featuring bands of stitches in different patterns, this doily can be used as a holiday decoration or for everyday use under a pretty bowl, plant, or lamp. 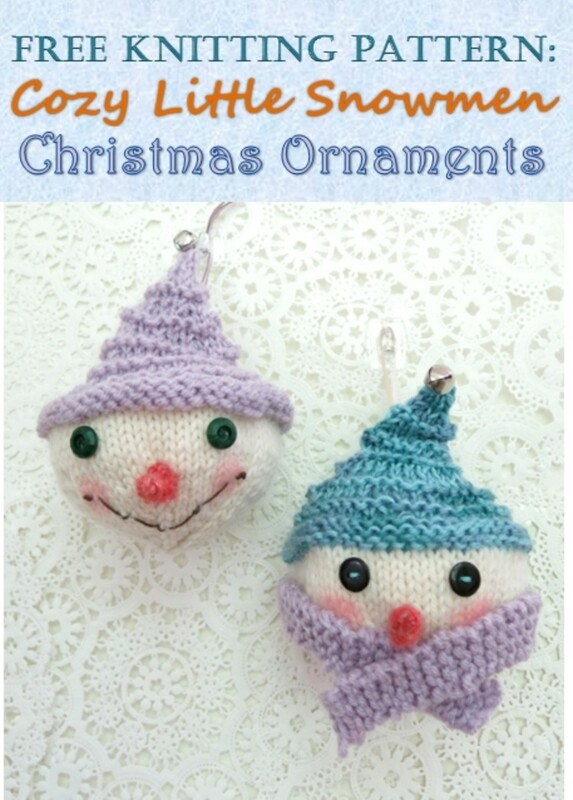 Cozy Snowmen Christmas Ornaments - More fun knitting projects with a Christmas theme - these rosy-cheeked little snowmen are bundled up against the cold with a warm winter hat and a cozy scarf around their faces. 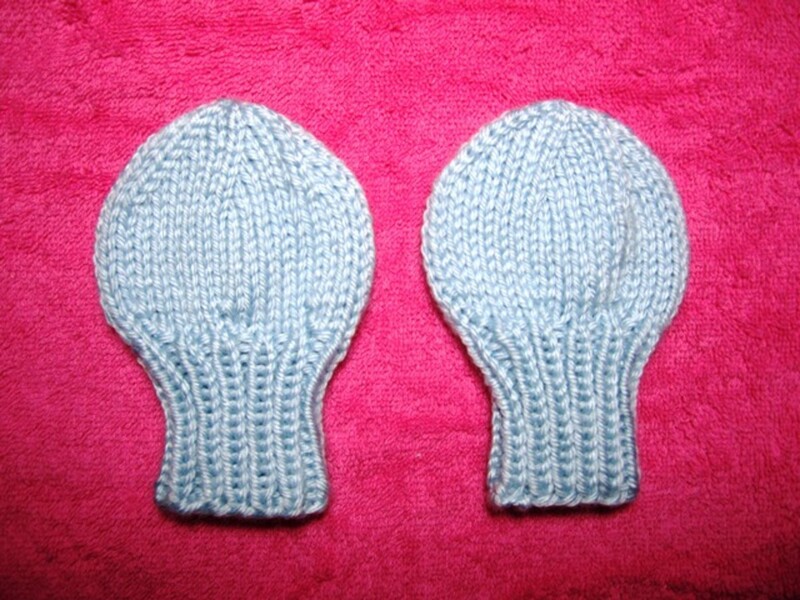 These snowmen are a quick knitting project since the heads and hats are knit as one piece in the round. And each snowman can be personalize with your choice of materials for their facial features and winter attire. 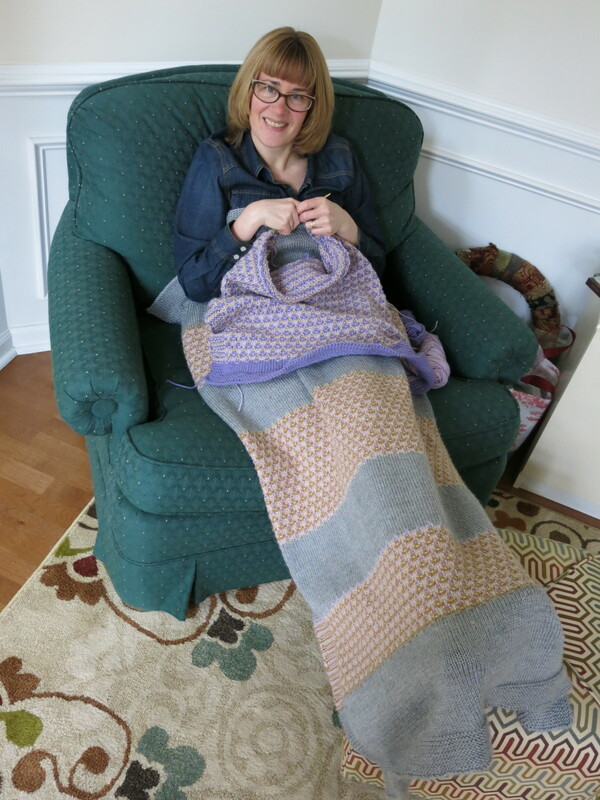 Mosaic Lap Afghan: Using the same mosaic design as the baby blanket above, I mixed this pattern with solid stripes to create an adult-sized lap afghan. Perfect for napping or keeping you warm while knitting, this blanket is adjustable in size and in the width of your stripes. 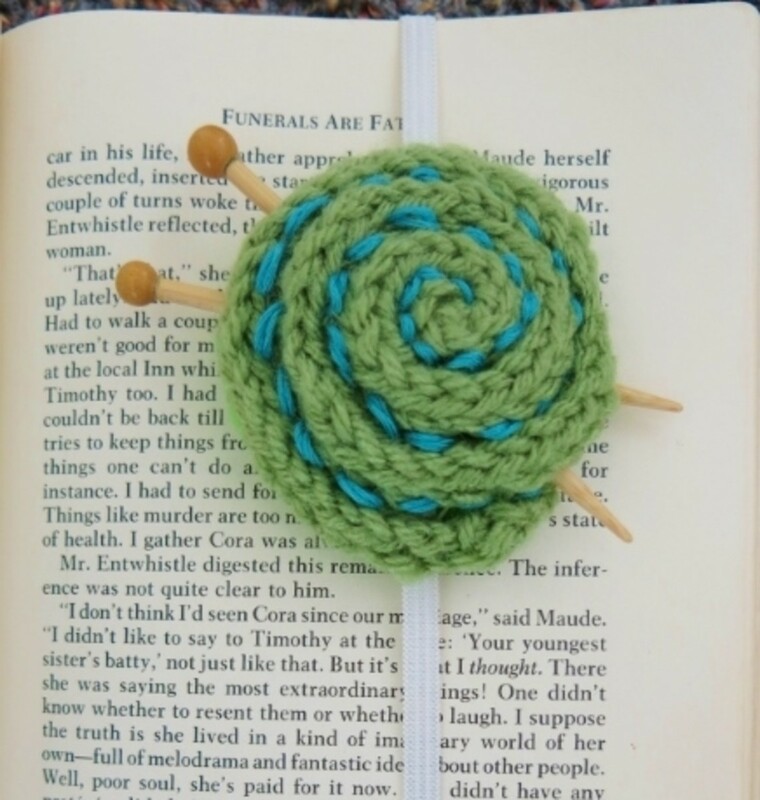 Easy Yarn Ball Bookmark - This little yarn ball bookmark is a fun way to enjoy your favorite book or mark the place of your current knitting project. This bookmark starts with a knitted i-cord and requires some basic sewing and a few other craft supplies, but is quite easy to assembly. This little yarn ball can also be used as a brooch, pin, or Christmas ornament. Instructions for making these other items are included with the pattern. Simply Special Washcloth: This simple washcloth has a basic knit and purl design, yet is special enough to give your bathroom a little spa-like feel. This washcloth would make a great gift, presented with a pretty handmade bar of soap. These patterns are all copyrighted (©) 2015 Donna Herron. No part of these patterns may be copied or reproduced in any way without permission from the author/designer. For personal use only. These patterns and materials made from these patterns are not meant for commercial sale. Looking for some help with your knitting questions? Visit my page of knitting articles and tutorials! I think your recipes would be great in a round-up. Can't wait to read it! Thanks so much for stopping by and commenting! What a great idea for a round up of articles Donna! I love this. I've thought about doing something like this for some of my recipes, now I am inspired to do it. Nicely done. Hi Emese! 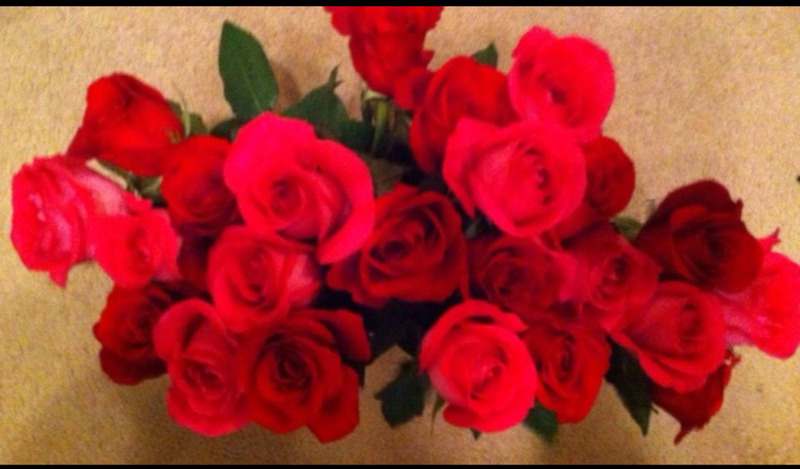 Thanks so much for your sweet comments. I actually look forward to summer and knitting. 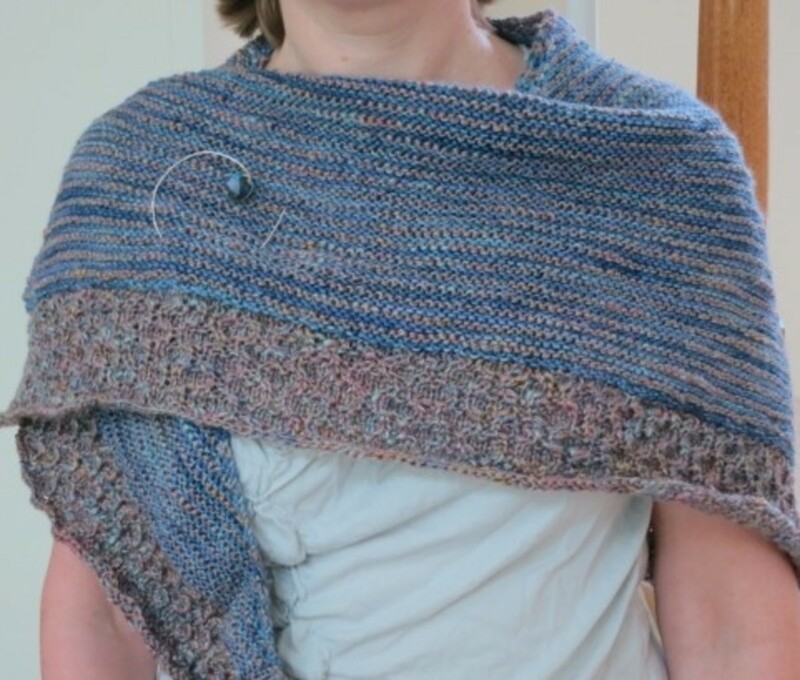 I use the summer as an excuse to either do a simple and relaxing knitting project, or I use the time to work on something large and complicated so it's done when the weather gets colder. I think you'll really enjoy making the knitted flowers for a bag or tote. I used my recycled tote all the time and get so many compliments on it. Thanks again! Thank you for sharing these wonderful patterns! They are all lovely. Now I can start knitting again :) I usually stop by the time temperatures hit the 100s here, which happens by May for sure, sometimes even April. But some of these projects are great even for my summers. I think I'll start with the flowers to decorate one of my handbags; they make the ordinary look awesome! What great memories! I think one of the many wonderful things about needle crafts is the passing down of knowledge and traditions through the generations. I hope you have someone to pass your love of crafting down to! I think it's more personal preference, because I know people who can knit just as fast as I can crochet. When the tables are turned, we're all slow. :) My maternal grandmother could do both - she used to get upset when we would mess up her counting of stitches, and we would just laugh. Now when it's me counting and someone is talking to me, its probably karma. :) I have the same love of crafts she did...if only she could see my progress since the crochet stitch that I apparently thought was a double (but wasn't). Such fond memories. Thanks, Jill! Those are two of my favorite patterns too, and items that I use or wear the most. Thanks so much, as always, for your comments, support, and share! I just love the fingerless mitts, and the purse is so cute!!! Pinned & shared. Hi brsmom68! There seems to be a great debate as to which needlecraft is easier - knitting or crocheting. I don't crochet, but have it on my New Year's resolutions to learn :) You're lucky to spin your own yarn and I'm sure you make lovely things with it. I appreciate you stopping by and commenting! The items are very pretty. If only I could knit. I can crochet almost anything, but knitting and I just do not get along. I have tried, and even bought needles. I spin my own yarn so it would be great to have some knit items made with it as well as crocheted.